Addmen provides free Online Test Series and Online Practice Tests to students, with free Online Test series for Bank, IBPS, JEE, CAT, GATE, NEET etc. on actual online exam system used by many organizations. Students can have a feel of the step-by-step process of Online Examination System beginning from online test registration to the end at online test results. Following is a step by step process of the online test system.Do Online Registration in the online test registration form given below on this page as you will do on the online test website. Username& Password will be sent on your email and by SMS. So provide a correct and active email ID and your mobile no. Once you receive the username and password, you have to come back to this page and login to the online test taking software as you will do on the online test website of your online examination. You will reach your home panel where you will see the list of online tests available for you to solve. You will click on the ‘Start Test’ button to choose the test to solve. You will reach the online test solution panel of the online test taking system. The online test timer will not start until you press the “Start Test” button. Your Name, ID and Photo will be visible on the screen for the invigilator to validate that you are the same person giving the test who has filled the form. You will also find link to read the online test instructions. Read the online question paper instructions carefully before you start the online test solution. 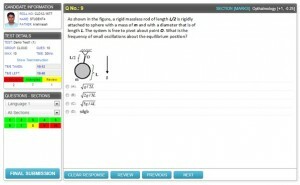 Start to solve the online mock test question paper. You can navigate through all the questions at your choice unless the online examination system for your type of examination restricts you from jumping between online test mcq question sections. You can read the questions and answer them, if you want to save your answer, then press the “Next” button and move to the next question. If you directly click on another question number to view another question, the answer of the previous mcq question will be saved but tagged as “not final”, so that you can view it later. This entry was posted in Online Test System and tagged free online test software, online exam creator, online exam management system, online exam test software, online examination software, online mcq software, online question bank software, online quiz software, online test creation software, online test generator, online test maker, online test software, online test system, software for online exam, web based exam software, web based test software. Bookmark the permalink.